You guys, today is November 25... that means Christmas is exactly one month away. Yikes! I've been trying to stay on top of my shopping list this year and get it done early but I'm still nowhere near finished. I figured it can't hurt to have a little bit of inspiration though, so if you're looking for some stocking stuffers or ideas for smaller presents, I've rounded up my top picks from a few favourite brands. Arbonne, for example, always releases a great holiday collection -- so prettily packaged you don't even have to use wrapping paper, and this year's is no exception. Their sets are a little more on the pricey side but the company is known for their use of high quality, natural ingredients. New for 2016 are the Olive Blossom & Eucalyptus Gift Set ($73), which includes a Cleansing Body Polish and Body Butter, as well as the Shea Butter Collection Hand Trio ($50), featuring three hand lotions in original Shea Butter, Lavender Mint, and Apricot Vanilla. Both are great for scent lovers! As well, Arbonne has brought back the Tahitian Coconut Lip Therapy Set ($50) that I reviewed last year; it's gotten a refresher with the Lip Salve now coming in a squeeze tube (plus an $8 price decrease!). Back in October, I also had the pleasure of attending a Holiday 2016 preview for The Body Shop (the same time I was introduced to their face mask line, in fact) and came away with a bunch of products which I'm not only loving, but are just perfect for gifting. 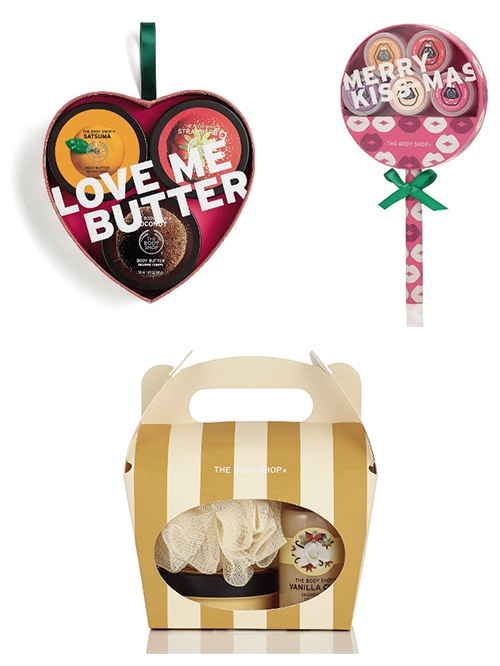 Proceeds from selected Christmas gifts go towards their newest campaign too, meaning that for every gift bought, The Body Shop will restore 1 square metre of rainforest in Vietnam, Indonesia, and Malaysia. I can't get enough of the Love Me Fruity Body Butter Trio ($15 CAD), which includes 50 mL versions of The Body Shop's signature Satsuma, Strawberry, and Coconut Body Butters. These travel-size containers are a serious lifesaver for me on my frequent work trips to Northern British Columbia with its cold and dry weather. The Merry Kiss-mas Born Lippy Lip Care Wand ($20 CAD) features the cutest packaging and five different lip balms (Strawberry, Raspberry, Satsuma, Watermelon, and Passionberry). You could also split it up and use individual lip balms as stocking stuffers -- saving $10 in the process! And if you get the chance, I recommend checking out the new limited edition Vanilla Chai scent... it's seriously yummy. The Vanilla Chai Treat Box ($10 CAD) contains a mini Body Butter and Shower Gel. If bath and body products aren't your giftee's thing, there are also some really affordable options from PC Home (yes, President's Choice, the brand you can find at Loblaws and Real Canadian Superstore). I love the idea of putting a nice ornament in someone's stocking and this Gold Geometric Star Ornament ($6 CAD) is super pretty. The PC Life At Home collection also has a couple different hot water bottle options (including some that are made with faux fur), but I personally think the Woven Buffalo Plaid Hot Water Bottle ($15 CAD) would appeal to most people. Plus, who doesn't want something cozy like this to curl up with during the cold weather? 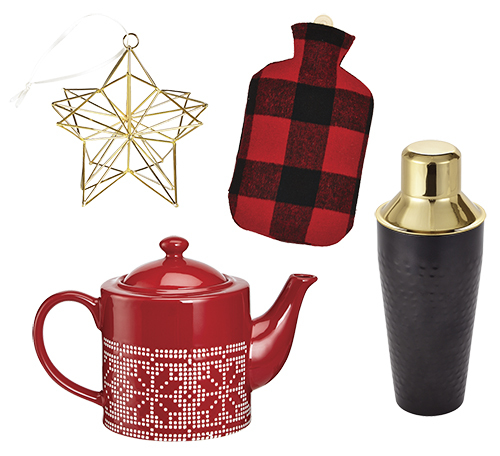 For the tea drinker, you can't go wrong with a cute tea pot like this Fair Isle Teapot ($19 CAD) and a lovely hostess gift would be this chic black and gold Bold Cocktail Shaker ($12 CAD). These seems like wonderful stocking stuffers! Thank you for sharing!! Wow the Body Shop sets are so cute, I love the packaging. I always love the body shop holiday sets! Arbonne is always My favourite go to place for quality stocking stuffers.